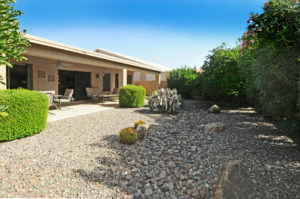 You are here: Home / Chandler AZ Real Estate / Oakwood Country Club – 9227 E Arrowvale Drive Just Listed! Oakwood Country Club – 9227 E Arrowvale Drive Just Listed! 9227 E Arrowvale Dr. – Oakwood Country Club – Available! At a fantastic, Oakwood Country Club location, this home offers a popular, expanded, Palmera floor plan with a great room and split-bedroom floor plan. Get ready to cook and entertain in the fully-remodeled kitchen with an SS oven and microwave. You’ll find replaced kitchen cabinets in a beautiful ”rustic Tuscany” wood and beautiful, granite counters in the kitchen and laundry rooms. This two bedroom, two-bath home features a separate, extended office with built-in cherry-wood desks and cabinets. And you’ll love all of the extra room in the extended guest and master bedrooms. The master features dual sinks, a shower and a spacious walk-in closet. There is also a newer water heater, and the exterior was painted in 2013. Relax on the covered and extended patio with lush landscaping that includes fruit trees in full bloom! It’s convenient to all major freeways and airports, and did we mention all of the amenities? Enjoy golf, tennis, pickle ball, a heated pool and spa, a workout facility, a clubhouse/rec room, biking and walkign paths, a gated community with an onsite guard and concierge, and more! To see this house before the competition and learn more now, click here.